Thanks to ToneStack's state-of-the-art Virtual Circuit technology, each ToneStack unit is the digital mirror image of a real analog topology. Unlike other FX apps that try to copycat with EQing and other gimmicks, ToneStack recreates the intricate designs of the real thing. The result is a warm, responsive tone with the natural behavior you find in analog units. 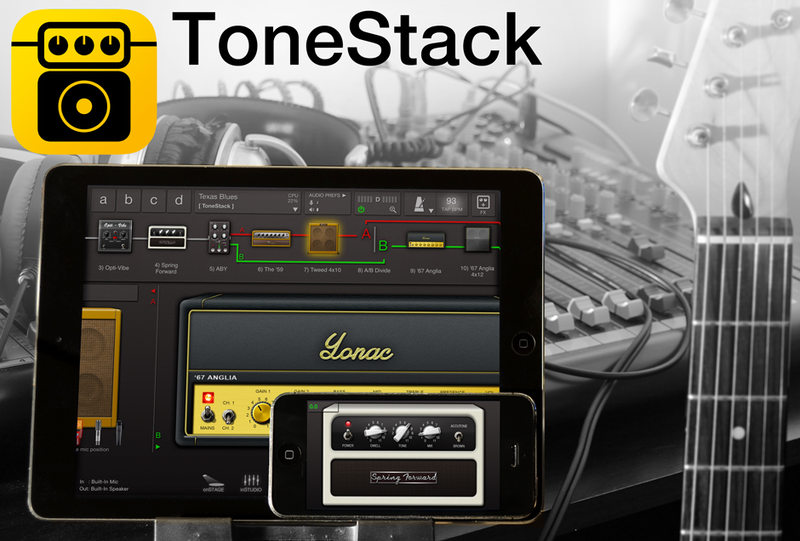 ToneStack offers you an enormous range of amps, cabs and effects: from sizzling hot tube amps to iconic stompboxes to pro-grade rack effects to high-end reverbs, ToneStack is the most complete plugin suite available for iOS. Each cab comes with three mics that have settable distance and position. 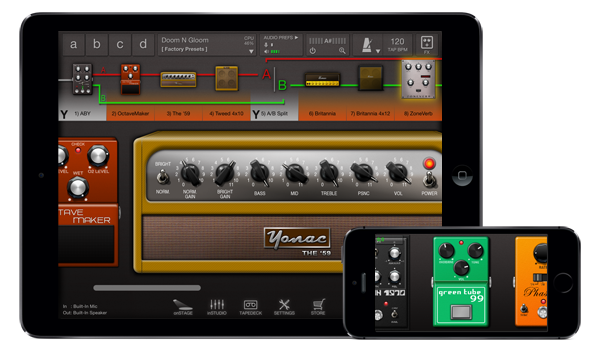 Add to all this the many powerful guitar effects that ToneStack brings to iOS for the first time: polyphonic octave splitters, harmonizers, realistic spring reverbs, virtual-reel tape delays, studio quality plate reverbs, and many more. Out-of-the-box, ToneStack comes with 6 amps, 6 cabs and 21 effects. Expand to a total of 46 amps, 44 cabs and 101 effects available for purchase in the ToneStack store. 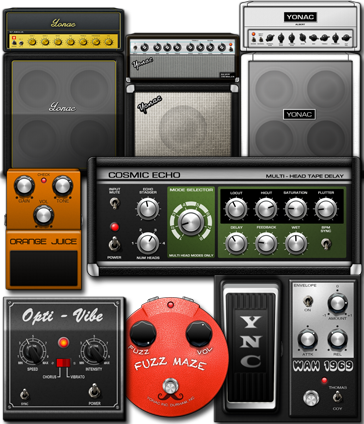 An insane range of diverse effects includes distortions, filters, mods, delays, reverbs, dynamics, rotary, and much more! Browse all our available amps and effects. Why be limited with just 4 or 8 effects that other guys max you out at? 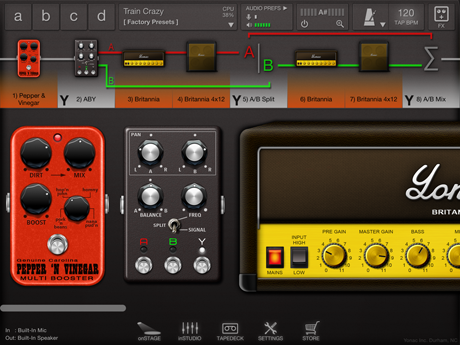 ToneStack lets you run a whopping 64 amps & effects simultaneously* so you can finally create that mega-chain you always wanted. What's more, use our unique ABY unit (the first of it's kind on iOS) to split your signal anywhere you'd like. Run dual amp setups, switch between or blend two signal chains, "multiplex" your signal by using frequency splitting and much, much more. You can even daisy-chain ABYs one after the other for countless permutations. Managing your signal chain is as easy as dragging-and-dropping a unit icon. You can match any amp with any cab for enormous tonal variety, and you can insert any unit anywhere on your signal chain: before an amp, between an amp and a cab, after the cab, and so on. 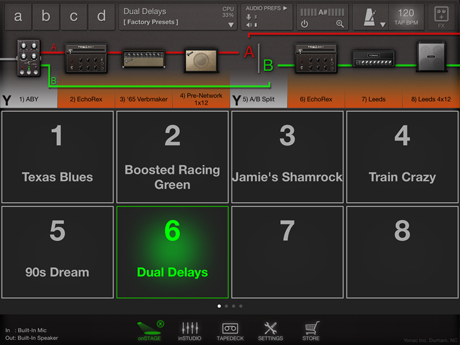 With Inter-App Audio, you can also insert any IAA-compatible app anywhere on your signal chain. Wanna quickly sketch out an idea, or cut a song and share it? 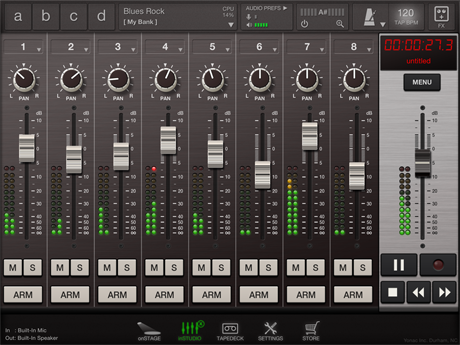 ToneStack includes a versatile and easy-to-use 8-track recorder** with many user-friendly features. Copy from or paste to any track; load audio from your music library; bounce or mixdown your creation and share it with the world while never leaving the app. ToneStack includes a powerful Tapedeck where you can easily make recordings or create loops. The Tapedeck features a high-quality pitch-shift and time compression/expansion module so you can slow down or speed up audio while retaining pitch, or change pitch while retaining speed. Moreover, you can import or export audio files through email, WiFi, iTunes and Audio Copy/Paste. You can also load songs from your iOS music library, and upload your creations to SoundCloud. ToneStack also comes with a very sensitive tuner with always-on and fullscreen modes, a metronome and a special onSTAGE mode for quick preset access and unit toggling while you are performing. Enjoy the full power of the industry's top MIDI and Preset Management frameworks. MIDI Learn is made super-intuitive thanks to ToneStack's WYSIWYG interface: just enter Learn mode, tap any effect or amp control and have it "learn". All the amp and effects controls are MIDI-programmable and you can control them with your favorite MIDI device or pedals. Thanks to our highly praised YPAT patch management system, you can effortlessly create UNLIMITED banks and presets and share them at the touch of a button. You can rename, reorder or favorite presets and even see the most recently used setups and search for presets by name. Inter-app connectivity is fully implemented: you can use ToneStack as an Inter-App Audio (IAA) effect with any other compatible app, and put it in any one of the three Audiobus slots. ToneStack also supports Audiobus state-saving for convenient access to your setups. View the ToneStack User Guide.